The Eye of Erasmus - Time Travel and Romance in one! This blog is about my favourite books, both those I read long ago, and those I've read recently. This is my first attempt to write about a recent book, one which I read for the first time earlier this year. Most of the books I read are ones which I've owned for years, and am re-reading. But yes, I do acknowledge that it's good to read new books occasionally, and so I intend to intersperse new books and old in this blog. Last time I wrote about Georgette Heyer, this time it's a living writer, Teresa Geering. At that time I read a gazillion books, some of which swiftly passed out of my memory and some of which remained. 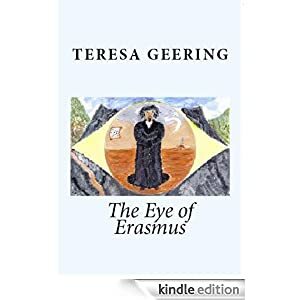 One of those which remained was Teresa Geering's fantasy, The Eye of Erasmus. I found myself enjoying it greatly. Erasmus is a hermit type, who has visions and falls in love across time with Shasta, a woman whom he first sees in a vision after walking on the beach in a thunderstorm. I've been interested in time travel since I read The House of Arden by E. Nesbit - still one of the books I like best and re-read constantly - at the age of 10/11, from the children's library. As soon as I could, I went out and bought it. And later, the description of Shasta in the market brings the smells and sounds of an eastern market immediately before us, 'a busy market on a warm day,' where she meets the cat Merlin and the boy Hesper. The twists and turns of the plot are entrancing, and I don't plan to write too much about this in case I include any spoilers. But the love story between Erasmus - a rather spoilt, vain young man whom we still can't help liking - and Shasta, are at the heart of the story. The descriptions of Shasta in her garden: 'The heady perfume of the white roses...It was wonderful to smell the sea air, mixed with the night perfume of all that grew in the garden...' take us straight into the beauty and romance of Shasta's life, while the descriptions of Erasmus's cave: 'It was set above water level and perfectly dry...near the entrance was a large pile of kindling wood gathered after a recent storm...neat piles on oilcloth were his beloved charts...' create the hermit's cave for us, and the isolated life of Erasmus before his meeting in the ruined house with Shasta. The visual imagery constantly draws us in. I was able to buy this book on Kindle for just over £2.00, which still seems amazing to me. We're living in an age when books have suddenly returned to the equivalent prices of the old time 'Shilling Shockers.' (I still see secondhand books around with prices like this on the cover.) And we can take advantage of this, if we're wise, before the eBook becomes established and the average price shoots up, as usually happens. I'm not prepared to go along with this. 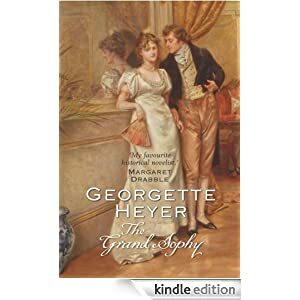 I think Georgette Heyer is an amazing writer, and I've been reading her since I was a child - I'm not prepared to say that my taste in writing is as bad as that implies! My first definite memory of her books is of reading The Convenient Marriage under cover of my desk in school one day when the Headmistress arrived to give us a pep talk about the Eleven plus, which we were entered for that year - so I must have been ten. We were all required to stand up when she came in, out of respect, and I remember the difficulty of keeping the book hidden while standing. I don't remember stopping my reading to listen to her talk, however, when we sat down again. First things first, and no doubt I'd reached an unputdownable moment - most moments in her books are like that. I can also vaguely remember the other kids near me trying not to giggle as they watched me clutching at the slipping book. Of course, I'd been reading Heyer for some time before the Headmistress episode. 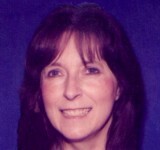 Her books were one of the joys of my life. As a child my favourites were the more romantic Devil's Cub, These Old Shades, and The Masqueraders. I matured as a teenager into Arabella and Friday's Child - more realistic and a little funnier, possibly. Currently my favourite is The Grand Sophy, with Cotillion and The Foundling not far behind. And why do I like her? Well, why do people still like Jane Austin? Wit, satire, a gripping and sometimes moving love story, a great plot full of twists and turns, depth of characterisation - will this do for a start? Heyer, like Austin, has a lightness of touch which never fails. You won't find squashy sentiment in any Heyer book, I'm prepared to swear. Her characters are real, funny, likeable (unless they aren't meant to be) and they are people whose lives we find we have jumped into and don't want to leave. Years ago I read and reread Heyer until I knew every word that was coming and had to stop for about ten years. When I eventually picked one up again, I was thunderstruck by how very good these books were. I've been more cautious since - I reread, but not too often. I hope to go on rereading her for the rest of my life. Or Lord Bromford's comment, 'One is familiar with the phrase, "A man may be known by the company he keeps:" can it be that he may also be known by the dances he permits himself to indulge in?' Of course, to appreciate the full humour of both these quotations one must already know Augustus Fawnhope and Lord Bromford, for Heyer's skill is not just in one-liners but in character drawing which takes us to the heights of satirical portraiture. Also, the main enjoyment of the book is in the absurdly comical situations which occur again and again. The ducklings running about in the last scenes, the episode of the bluebell wood where Fawnhope and Eustacia are locked in together, the escape of the monkey – comedy builds on comedy. Heyer is not afraid to introduce a more serious note from time to time, but constantly pricks the bubble of extreme emotion with a witty comment. But I suppose the main reason I keep coming back to this book is the character of Sophy herself. A second Flora Poste, a manager of people's lives, as the title suggests, Sophy is always eager to help, 'when the welfare of people one cares about is concerned.' Sophy is someone we can't help liking. We want her schemes to succeed, and only very occasionally enjoy it when Heyer for a moment puts her down. Sophy is the 'Dea ex Machina', except that far from arriving at the end to sort things out, she is very much up to her neck in everything that happens. Her interview with the moneylender is one of the most memorable scenes of high comedy in English Literature. Haven't you ever read Georgette Heyer? Wow, how you're missing out! Don't waste another moment. Her books are popular enough still to be available in every bookshop, as the saying goes. Doesn't that tell you something? Getting Published in the eBook Revolution. Hi, guys! My second blog already - amazing! This is a bit of a one-of, more generalised subject. The next blog will be about a particular book/writer. (One-of is correct, by the way, not 'one-off,' in case you were thinking, wow, can't even spell right! It's a shortened form of 'one of these.') Moving on, then. 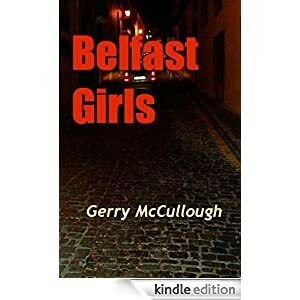 The amazing thing to me about having my book Belfast Girls accepted and published for the first time is that because of the eBook revolution I am selling many times more eBooks than paperbacks. A year ago, I hardly knew eBooks existed. Now, they are taking over the market, it seems. I’ve been writing since my childhood, and enjoying writing, but it’s only recently that I’ve had a full-length novel accepted and published. I’ve had nearly fifty short stories published, which has been very encouraging, especially as several of them have won prizes or been short listed in major competitions. But my ambition has always been to have a novel out there, and after quite a few rejections, I’d begun to think I’d never reach my goal. It was when I heard about Night Publishing, a new publishing company, through a friend on FaceBook, that things started to happen for me. Bruce Esler, who had read my book Belfast Girls on www.Authonomy.com – the Harper Collins site – and admired it, wanted to see the manuscript and so I sent it along and Tim Roux, his partner, agreed that it was something Night Publishing should take. Needless to say, I was over the moon! Belfast Girls is the story of three girls growing up in the new, emerging Belfast, after the ceasefires, and of their lives and loves. It is also the story of the men who matter to them. It is a thriller, a romance, a comedy – like most people’s lives. But it has, I hope, a lot more depth than that suggests. The three girls come from different religious backgrounds, and, starting off as childhood friends, they manage to hold on to that friendship in spite of everything. The plot includes kidnapping, drugs, high fashion, prison, and the spiritual awakening of one of the girls, glitter and danger side-by-side. This is a book that both men and women can enjoy and that holds something for them all. Growing up, as I did, during the troubles, I was very aware that all over the world there was a very simplistic view of what was happening in Northern Ireland, i.e. people seemed to believe that all Catholics thought one thing, and all Protestants thought something else, and that all Catholics hated all Protestants and vice versa. I knew that wasn’t true. It was so much more complex than that. Many on both sides of the divide were horrified at what was happening and only wanted peace and reconciliation. I wanted to write something to show, without lecturing, that a lot of ordinary people in Northern Ireland had no problem with each other – it was just a small percentage who were fighting; and another relatively small percentage who supported them. By the time the book was finished, the troubles were over, so recently I rewrote it to reflect the same thing in the current climate. Of course, like any writer, I also just wanted to write a book, whatever it was about. I had various characters in mind from the start, and I wanted to develop their lives. When I learnt that Night Publishing intended to sell mainly over the internet, I was a bit worried. How would this work out? Didn’t people mostly buy from actual bookshops? Would enough people be computer literate to know how to buy Belfast Girls? But I’ve found that I needn’t have worried – there’s a swiftly growing audience, not only for internet sales, but over and above that for eBooks. It’s been a great surprise and a delight to me to see my novel doing so well. When I first read a review by the Ulster Tatler which chose Belfast Girls as its Book of the Month in March, I couldn’t believe it. When I saw Belfast Girls listed as No. 54 in Women’s Literary Fiction on UK Kindle early in March, its first appearance in a top 100, I thought I must have misread the ranking, and even more so when the book went on to reach No 8. And when it reached No. 26 in Romance on USA Kindle, that was amazing. The final shock came when I heard I had won the Night Publishing Book of the Year Award. And yet, having said this, I’m daily hoping and almost expecting to see my book go up the charts even further and I’m so excited watching as it keeps on climbing. People are buying eBooks now, including my eBooks, by the bucketful! For some time I've been wondering if it would be a good idea to create a blog, or if it would just be too time consuming. After all, I'm a writer, I'm meant to be writing books and short stories, not blogging. Decisions, decisions. Like Hamlet, I had to think the thing through, though not, in my case, whether or not to murder my uncle. So the die is cast. (This expression comes from throwing a dice - the singular of dice is die or dy, did you know? I wonder if the singular of mice is mie or my?) But will it come up a six or a one? Only time will tell. Next question, what will I write about? I've been a reader all my life, as well as a writer. So I'm going to write about books. Some of these books will be my own old favourites. Some will be new books which I've come across in the last year or so, since I started to get involved with the writing/ blogging/ facebooking/ using the internet community. And from time to time, my own book, Belfast Girls might even get a mention, who knows? You can buy it here, by the way! As an eBook, that is. You can even buy it as a paperback in the same places - but if you do, I warn you, you'll be striking out a new path through untrodden jungle. Well, that's a slight exaggeration - but you will become one of a smaller, but still admirable, elite group - most people seem happier buying the eBook. The times they are achangin'! That's all for now - see you again soon!